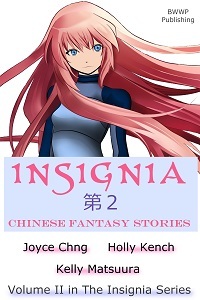 Cover Reveal: ‘Insignia: Chinese Fantasy Stories’ & ‘Insignia Vol.1.’ Promo! This volume is a little shorter than the Japanese anthology, but we have six stories with mixed themes and sub-genres for you. We can’t wait to share more details and story excerpts in April! 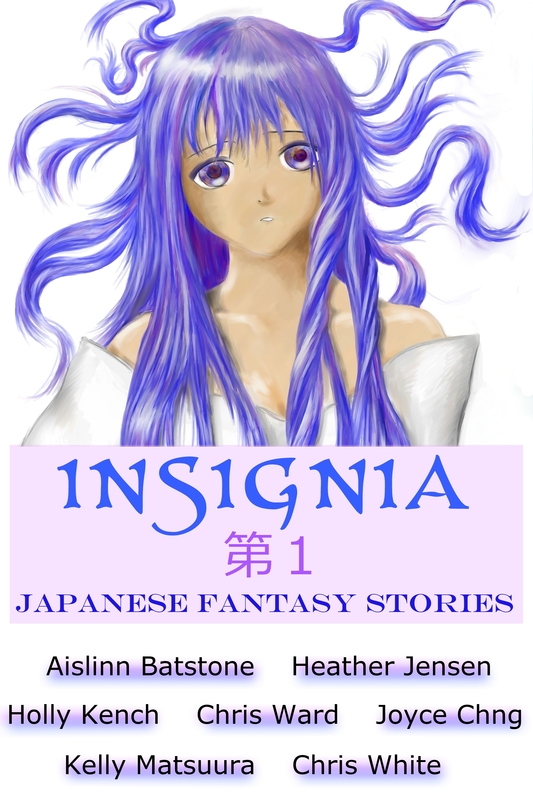 If you don’t have a copy of Insignia: Japanese Fantasy Stories yet, now is your chance to grab it on sale! We’re dropping the price to $1.50 on Smashwords and all Amazon sites until March 31st. That’s half-price! I huddled in my bed, my quilt pulled up around my neck as though the warmth of the fabric could protect me. I couldn’t stop shivering as I watched and waited. The family cat, Ayumu, sat at the end of my bed, licking his paw. Unconcerned by my rising terror, he stood up, padded around the end of my bed in a circle, and sat back down. Without warning, his head shot up, tilted to one side and his feline eyes, which were always a little too human, bore into mine. I shuddered in anticipation. Without moving his gaze from mine, the cat’s limbs elongated. Smoke, appearing from nowhere, swirled around him and his body started to transform. The ears on his head sunk into his skull, as his head grew bigger. The smoke thickened and wisps of it flew towards me, stinging my eyes and catching in my throat. Coughing, I threw my hands up over my face, losing sight of the cat for the briefest second. When I lowered my hands, Ayumu was nowhere to be seen. Instead, next to my bed stood a man, at least seven-feet tall, with long, loose black hair that floated around his head and danced with the smoke surrounding his body. There was something wrong with his face. Staring, I realised it wasn’t a man’s face I was looking at, rather a cat’s face overlaid with that of a man, creating a weird duality of which my mind couldn’t quite make sense. “We are bakeneko,” the creature’s voice boomed across my bedroom. Smoked tendrils dashed out, licking inches from my face. Holly Kench is a writer and feminist, with a classics degree and a fear of spiders. She enjoys writing a range of genres, but has a particular love of fantasy. Holly seeks stories that contemplate the world as much as books that provide escape, but doesn’t think the two are mutually exclusive. These are the sort of stories Holly tries to write. She is convinced we can change the world through popular culture. Holly manages Visibility Fiction, a project dedicated to the promotion and publication of inclusive young adult fiction. Visibility Fiction began as a result of Holly’s desire to create a space that celebrated and facilitated the telling of stories with diverse characters. In this capacity she has had the privilege of working with both Kelly Matsuura and Joyce Chng, who have assisted her in a journey of not only editing, but also writing her own stories exploring diverse cultures. Holly also writes about her life as a stuffed olive at: www.stuffedolive.com.au.